An interview with Mosab Hassan Yousef, son of a founder of Hamas, and Gonen ben Itzhak, a former Israeli Shin Bet agent with whom he worked for ten years. 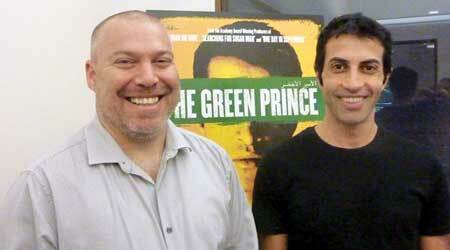 Mosab Hassan Yousef, a former Hamas insider, and Gonen ben Itzhak, a former Israeli agent, are featured in The Green Prince, a new documentary that tells the story of their relationship. I met with them in Boston during a recent trip to promote the film. Their warmth and openness was as obvious as the closeness of their connection. Mosab Hassan Yousef’s father is Sheikh Hassan Yousef, a founder and leader of the West Bank based Hamas. He was recruited in 1997 at the age of 19 as an informer for the Israeli security agency, the Shin Bet. His recruiter was Gonen ben Itzhak, the son of an Israeli general. Mosab worked closely with Gonen (who worked under the alias Captain Loai), serving in this extremely dangerous role for ten years. Their story, first told by Mosab in his 2010 book, “Son of Hamas,” is now the subject of the riveting new documentary, “The Green Prince,” directed by Nadav Schirman. Sincere and expressive in manner, Mosab is a spiritually-motivated thinker who has traveled considerable distance from the Muslim orthodoxy within which he was raised. “I was threatened by hell and tempted by heaven,” he says, reflecting on the “religious box” in which he came to feel trapped. His ardor for Islam was strong until, in his late teens, he became disillusioned with Hamas’ integration of religion and violence. Later on, Mosab found inspiration in Jesus but he came to question institutional Christianity. “I found walls of separation again and this was not what I was looking for,” he said. Gonen remarked about the distinctiveness of their relationship, in contrast to other intelligence “assets” with whom he had worked. “It was a very brutal time, the time of the Second Intifada, and we had to deal with a very deadly Hamas terror cell in Ramallah. They were behind many of the terror attacks inside Israel and without this mutual respect, understanding and trust I don’t think we would have been able to achieve what we did” he said. In order to gain Mosab’s complete trust, Gonen sometimes had to employ what he called “creative” techniques. Eventually, Gonen was dismissed from the Shin Bet because of his unorthodox, though highly effective, methods. Gonen credits Mosab with courageously helping to prevent many, many terror attacks inside Israel, yet Mosab came across not as an operative but as a philosophically inspired thinker. “What is happening there is not only a conflict between Israelis and Palestinians, but a conflict between the lower self and the higher self; the lower self which fights for animal survival, and the higher self which fights for enlightenment and salvation,” he shared. Speaking idealistically, and identifying as a student of yoga, he wished that people in the Middle East would learn to breathe and to eat better, and to develop the kind of personal balance that might enable more critical and independent thinking. Both men were philosophical about the impact of their story. Mosab too hopes his actions will help others to reach beyond the constraints and ideologies that limit them.